It’s timely that the Congressional Budget Office (CBO) put out new numbers on America’s financial situation this week. By the end of the week, we’ll be hitting the debt ceiling again. The CBO’s report, which dropped the bombshell that Obamacare is projected to push 2.3 million people out of the workforce, is chock full of other disheartening information. For starters, “The nation’s fiscal situation is much worse today than when President Obama first took office,” says Romina Boccia, Heritage’s Grover M. Hermann Fellow. The outlook on the debt is somber. Entitlement spending continues to grow on autopilot, and “Washington’s failure to handle the problem responsibly means a higher tax burden and a slower economy for younger generations,” Boccia explains. 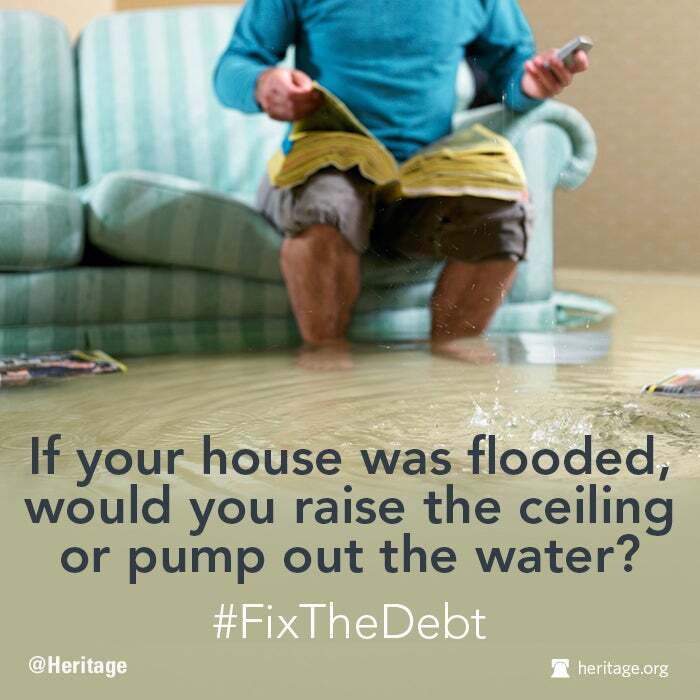 The debt drags down the economy—it has contributed to America’s drop in the Heritage Foundation/Wall Street Journal Index of Economic Freedom rankings. The U.S. dropped out of the top 10 freest nations this year. By the way, one of the biggest ballooning expenses is interest on the debt, which rises from about $250 billion a year now to more than $800 billion in a decade. Wonderful: We will be paying more taxes not for vital public services, but to finance our past sins. Of course, the Obama Administration and the media have found a way to spin the gloomy forecast by pointing to the CBO’s announcement that the budget deficit is down this year. The deficit shows how much government spending has exceeded revenue (the money the government is taking in from taxes) in a given year. The deficit is only shrinking when you compare it to the fact that it exceeded $1 trillion every year during President Obama’s entire first term. This is progress? Half-trillion-dollar deficits would have been unthinkable a decade ago; now they are cheered as progress. We are living in an Obama era of diminished expectations. President Obama’s nominee for a top Justice Department job is under scrutiny for ties to a convicted cop killer. Immigration reform is dead this year — at least that’s how these House conservatives see it. Would a company voluntarily give up $2 billion a year in sales? CVS did, and totally without government interference. Parents like the Garcias, desperate to send their kids to a better school, can end up in big trouble due to the government’s limiting education options. In case you missed it: The Obama Administration’s Syria policy is melting down. Cops took this woman’s money—and she had to fight to get it back.